Doug Parrett, Urbana, Ill., evaluated the 77 entries. 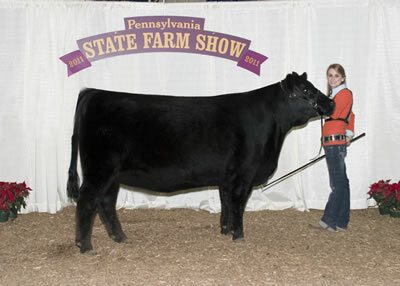 L V A Giddyup Cheyenne 1001 won grand champion female and grand champion bred-and-owned female at the 2011 Pennsylvania Farm Show's Junior Angus Show, Jan. 9 in Harrisburg, Pa. Alayna Clark, Mifflintown, Pa., owns the January 2010 daughter of B E B Juneau 104. She earlier won junior calf champion. 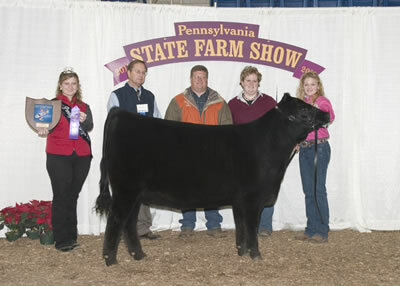 B C A Scaara Belle 933 won reserve grand champion female at the 2011 Pennsylvania Farm Show's Junior Angus Show, Jan. 9 in Harrisburg, Pa. Hannah Grim, East Berlin, Pa., owns the July 2009 daughter of B C A Belle Ringer H62. She first won intermediate champion. 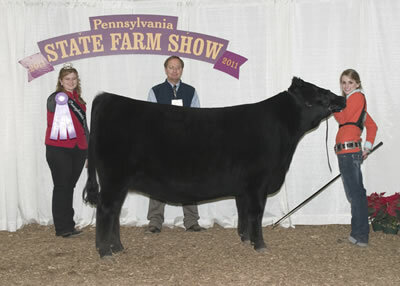 B C A Carrie D85 won senior champion female at the 2011 Pennsylvania Farm Show's Junior Angus Show, Jan. 9 in Harrisburg, Pa. Bailey Druck, York, Pa., owns the winning female. Just Enuff 1961 Flicka won reserve senior champion female at the 2011 Pennsylvania Farm Show's Junior Angus Show, Jan. 9 in Harrisburg, Pa. Brent Stufflet, Lenhartsville, Pa., owns the winning female. 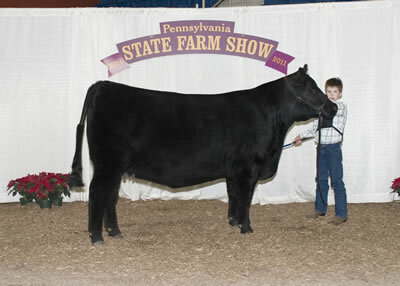 Cedar Hill Scaara Dixie 439 won junior champion heifer at the 2011 Pennsylvania Farm Show's Junior Angus Show, Jan. 9 in Harrisburg, Pa. Haley Sweitzer, Wellsville, Pa., owns the winning heifer. 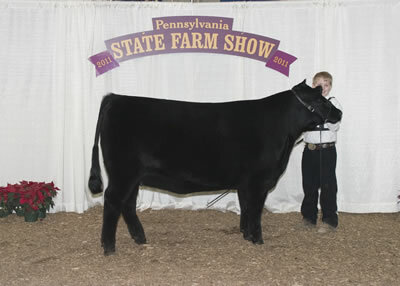 B C A Hallie H911 won reserve junior champion heifer at the 2011 Pennsylvania Farm Show's Junior Angus Show, Jan. 9 in Harrisburg, Pa. Hannah Grim, East Berlin, Pa., owns the winning heifer. 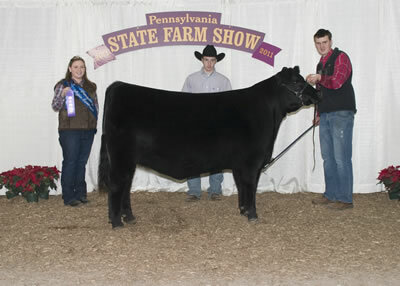 Cedar Hill Charlie Nadine159 won reserve intermediate champion heifer at the 2011 Pennsylvania Farm Show's Junior Angus Show, Jan. 9 in Harrisburg, Pa. Dakota Mayle, Dover, Pa., owns the winning heifer. 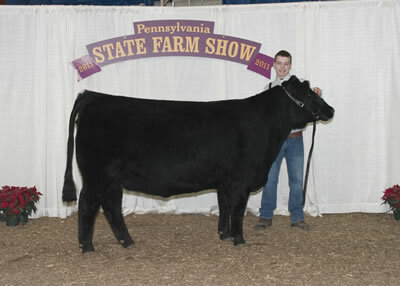 Freys FCF Eriskay U107 won senior heifer calf champion at the 2011 Pennsylvania Farm Show's Junior Angus Show, Jan. 9 in Harrisburg, Pa. Josh Bledsoe, Quarryville, Pa., owns the winning heifer. 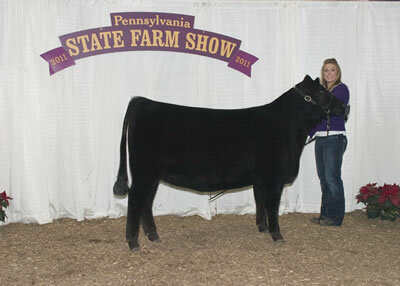 Cedar Hill Scaara 259 won reserve senior heifer calf champion at the 2011 Pennsylvania Farm Show's Junior Angus Show, Jan. 9 in Harrisburg, Pa. Alysha Sweitzer, Wellsville, Pa., owns the winning heifer. 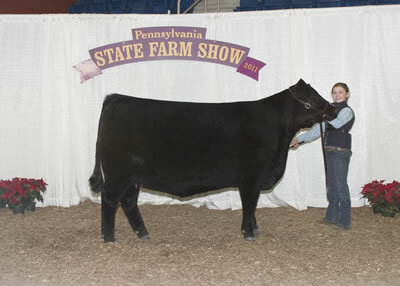 U H A Miss ME 722 010 won reserve junior heifer calf champion at the 2011 Pennsylvania Farm Show's Junior Angus Show, Jan. 9 in Harrisburg, Pa. Lindsay Upperman, Chambersburg, Pa., owns the winning heifer.